Whenever I get asked if I have any advice for newer knitters, I almost always say the same thing, “Try stuff. If it doesn’t work, try other stuff.” It’s obnoxious advice, but it’s the best way to learn what you like best. Knitting is kind of magic because it’s easy to try new things over and over again. 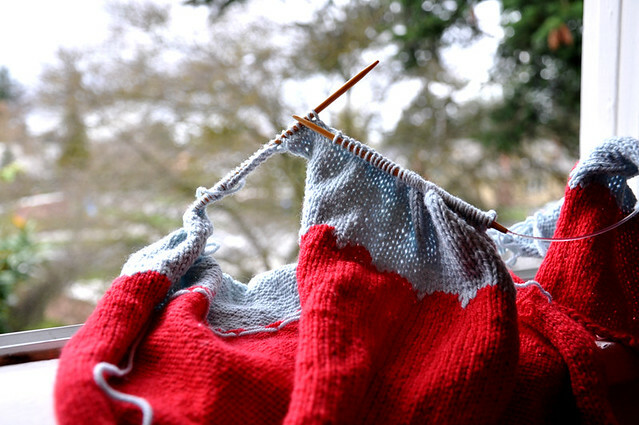 If something doesn’t work, you almost always can rip back you knitting and do something else. Sometimes you knit and frog swatches using the same yarn over and over again until you find the perfect technique. Sometimes you take apart an almost finished sweater body because you made a small mistake and have to start over again. It’s frustrating, but you have the chance to do things over until they’re the way you want them. Unlike a lot of other crafts, knitting offers second, third, and fourth chances to get things right so a mistake isn’t death sentence for a project. Good yarn can survive being worked, taken apart, and worked again slightly differently. There’s no reason to not try things and risk mistakes. Be adventurous and try stuff. It’s not a big deal if it doesn’t end up working out because there are always other things to try. I have to admit that it can be obnoxious to take my own advice. It’s not really a big deal that I have to do over most of this sweater. I’ve just started the body rows after casting on the underarms. The fronts and back didn’t take too long to knit a second time and I took the opportunity to change how I did the scallops. I changed my mind for the 1,000th time and decided that I like the wider ones better. That’s the small perk of doing this over. It’s a little annoying, but that’s all. You’re so right. I wish sewing was this forgiving! While at the beginning it was such a huge deal for me to frog and reknit, now I have no problem doing that. I actually get a little embarrassed when I read older posts where I complained about having to frog a few rows or re-start a sweater back. That is exactly why I love knitting. There are very few things you cannot rip back. So true… I’ve learned more about knitting from having to frog back and correct my mistakes than any book could have taught me. It is frustrating, particularly with lace patterns, but what’s the point in carrying on without frogging back if you know you’re never going to be happy with the end result? I’m so lazy about it sometimes. I get discouraged when things don’t go right (but of course, it takes time, I should know this!). I’m going to work harder to push for excellence in my knitting like you do!